I was delighted to come into work today and find this book on the table in our staffroom. Sarah had been given a copy by the publishers as she was one of a number of people who contributed to the book. Other contributors include the author, David Mitchell, Professor Simon Baron-Cohen and the book has been reviewed by, for example, Laura James the author of The Odd Girl and Carrie Grant. It is a beautifully written book and Jessie is an award winning journalist at The Times and has freelanced for various national newspapers and magazines. She is a mother of two, her 7 year old son is Autistic. 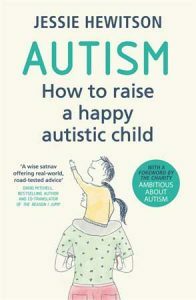 She ends with a conclusion and there is also a very helpful glossary of terms, Autism acknowledgements in which Sarah is acknowledged as one of the people who have read chapters to “sense check it and lend me their expertise”. There is also two indexes which are very helpful. I have just started to read this book and I am so impressed by it that I am going to bring it in any case to the group on Wednesday and order several copies for our team.